With 2 Pups of Honor, Brenda & Lisa Get Hitched After More Than 10 Years of Loving Relationship! It isn’t every day that I giggle when I first meet a couple. And giggle I did! You see, when the hotel door opened and I first met Brenda and Lisa, I also was introduced to their two sweet pups of honor – and I couldn’t stop smiling. Being such a dog lover myself, it brings me great joy and comfort to have a dog or dogs at a wedding ceremony. In so many ways, big and small, dog energy relaxes everyone. You would think otherwise but after having been at many ceremonies with dogs, our canine friends have an amazing ability to bring peace, joyfulness and delight to a day that is often imbued with great expectation and gentle tension. And so, it was my pleasure to marry Brenda and Lisa, in a sweet ceremony for 2, at the beautiful Willows Lodge, joined by their witnesses. This beautiful couple ventured to Seattle from the Mid-West to be married after 10 years together and their sweet and personal exchange of vows (from their cell phones) was just perfect for them in all ways. 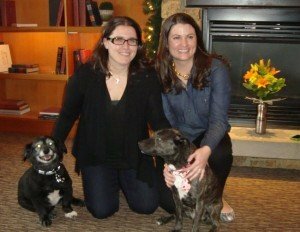 Comments Off on With 2 Pups of Honor, Brenda & Lisa Get Hitched After More Than 10 Years of Loving Relationship!